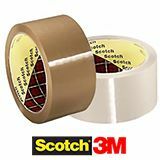 These 3M Scotch machine length tape rolls continue to lead the field for quality, consistency, reliability, and overall value. Perfect for all semi-automatic and fully automatic box sealing machines, this machine tape will resist abrasion, moisture, chemicals, scuffing and will mould over edges and rough surfaces for a tight seal. With a total thickness of 48 micron, a quality 28 micron polypropylene film backing and a synthetic rubber resin, solvent-free hot melt adhesive, this 3M tape is environmentally friendly and will not let you down. Due to its consistently reliable performance in a wide range of applications this tape is regarded by many as the industry benchmark in quality box sealing tapes. Also available in standard 28 micron and heavy 35 micron hand rolls. Speed up your packing operation! Don't forget your tape dispenser.